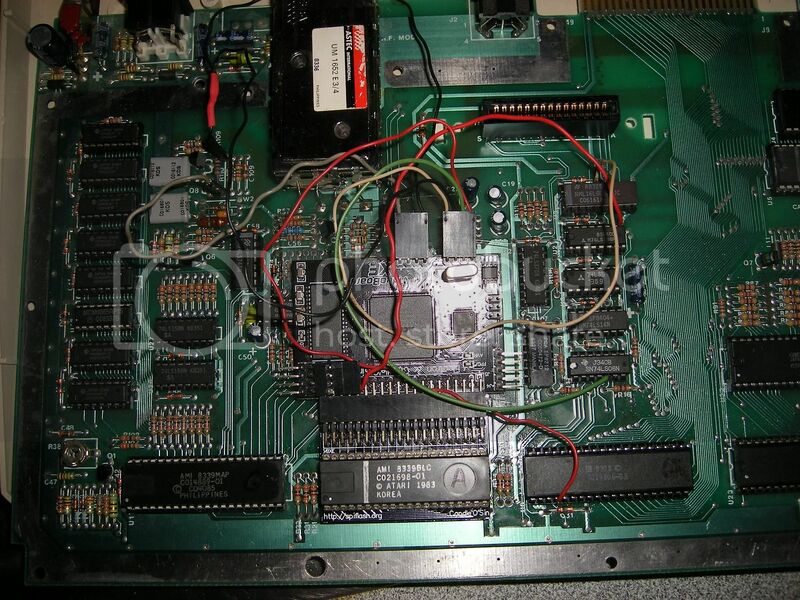 retrobrad Forum Index -> Amazing Atari! 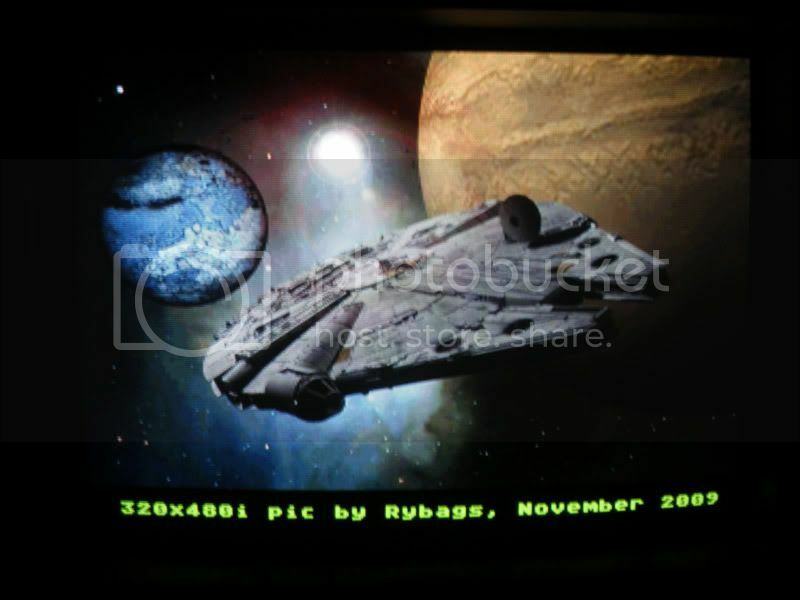 Yes, that is a picture coming from an 8-bit Atari. 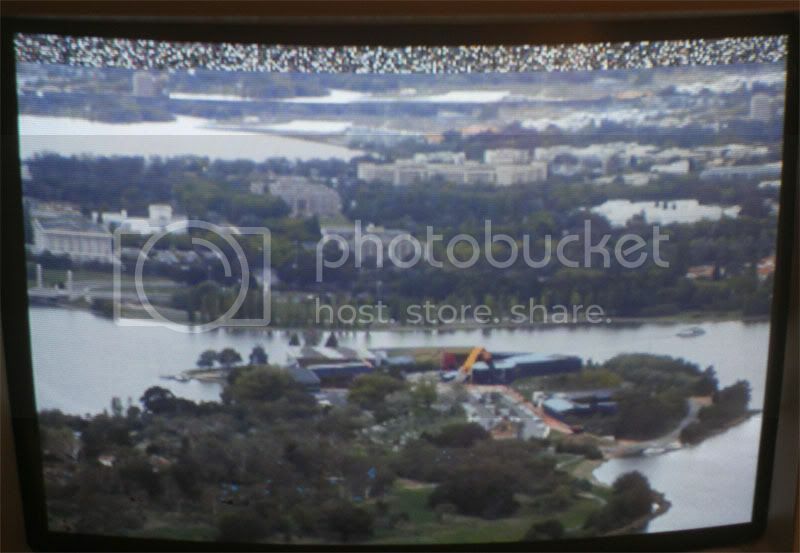 VBXE (Video Board XE) is an upgrade board that plugs into the Antic socket (for full access to the address/data buses) and takes over the graphical functions normally provided by GTIA, as well as providing many graphics enhancements, primarily overlay, attribute map and blitter functions. It also boosts the system with 512K of Expanded RAM. There's around 85 out there now, mine is probably the only one in Australia and possibly the Southern Hemisphere. Cost about $180. - palette control via 21 bits RGB per entry. 4 palettes of 256 colours each available. 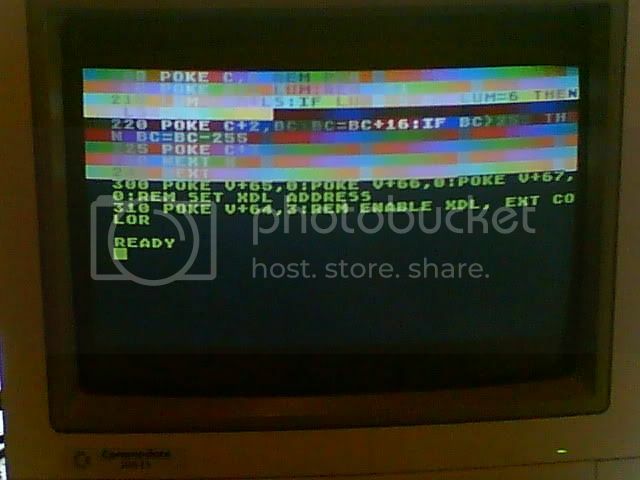 Normal screen thus has possibility of 1024 colours of a possible ~ 2 million. - attribute maps definable in sizes of 8x1 up to 32x32 Atari hires pixels. - blitter with Copy, AND, OR, XOR, and ADD modes, as well as collision detection. Blit works at 14 MHz rate. 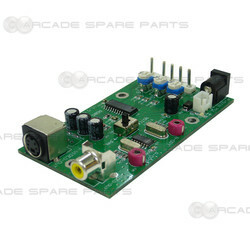 - video output is RGB 15 Khz rate, compatible with legacy monitors such as the Amiga 1084. - access to expanded RAM can be by a Rambo-compable window at $4000-7FFF or by method allowing access in preference to normal system RAM at any 4K base address, sized to 4, 8, 16 or 32K. Not a great deal of software available right now, but people including me are working on game enhancements, applications, new games and utilities. The good news for those wanting a preview - VBXE is supported by the Altirra emulator. Man that is some serious power coming from an 8-bit machine! What monitor are you running that on? I am guessing you could probably put it through a scan doubler to output to a modern vga screen? It's running on a C= 1084S monitor. I tried running through an A520 so I could plug it into my capture card on the PC... no good... the VBXE uses more "standard" voltages for the RGB signal, so the signal is getting muddled and probably attenuated too much. I looked around at computer fairs but they don't seem to carry the type of convertor I'm after. I'm not so much concerned in getting a scandoubler - I'll be more than happy with getting the RGB 16 KHz converted to S-Video and composite. I've got a circuit that was designed to add those outputs to Atari ST models that didn't have a modulator built in, using the same chip that ST and Amiga A520 modulators use, so will be trying something based on that. I use these with my arcade machines to convert the RGB output of the game boards into composite video for display on a standard tv. I might ask others if they've tried it. Probably well worth my while if this A520 modulator conversion doesn't work out right. 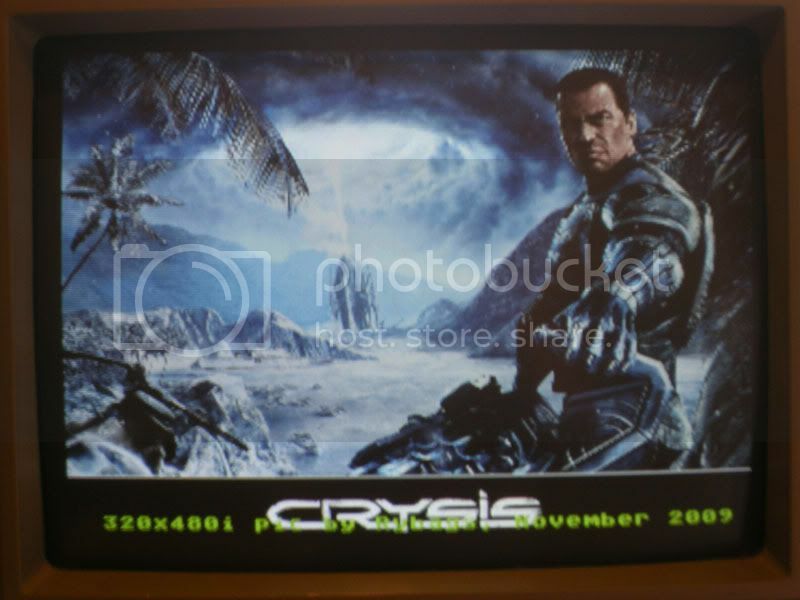 The funny thing is that I tried to use some of my Amiga modulators on my arcade machines and could only get them in black and white because of how the modulator handles the colour burst signal. I tried all sorts of ways around it but could never actually get it to work properly. Do you know the specifications of the signals that come out of your system? The Amiga and Atari ST both supposedly use non-standard voltage levels on their RGB output. Additional to that, I think the ST at least doesn't have a Composite Sync, you need to combine them (XORed) externally. The voltage levels used by VBXE are apparently 1V P-P where the other 2 use somewhat larger ranges. I've actually desoldered the MC1377 from an A520 modulator and put a socket in place. So now, I've got that chip sitting in a protoboard, just have to grab a few spare hours and see if I can get a circuit made up to get S-Video and/or Composite out of the VBXE. The chip itself can supposedly generate it's own Colourburst, or you can use a crystal to supply it externally. You also have to note that PAL uses ~ 4.3 MHz and NTSC uses ~ 3.6 MHz. The other thing is that there's a pin on the MC1377 that should be tied to GND (?) if you want NTSC output. I didn't actually realise that they used non-standard voltage levels. The one thing that I didn't like about the mc1377 was all the required external circuitry. So when I found these ones from the arcade site for $25 pre-made on a PCB I thought it was a bargain! Supposedly the MC1377 can operate without the external crystal. Some of the external input circuitry you see with the Amiga is to clamp the voltages down to what it needs to operate with. That AD725 looks nice... only 2 problems - neither Altronics or Jaycar seem to have them in their online system, and it needs a 17.734 MHz crystal which they also don't have. The ~ 14 Mhz crystals to do NTSC are common as... you practically find them in cornflakes boxes, and are fairly common especially on old motherboards and earlier PCI and ISA cards. The base PAL colourburst crystal of ~ 4.4 MHz is fairly common, I picked one up for a few bucks. I did find a slightly cheaper ad722, which does the same job. I don't actually need it anymore because the converter boards turned up in the mail before the ad722 did. You can have it for free if you want - it is a smd ic. Sounds great to me... I could PayPal you a bit of cash to at least cover postage to Canberra.